Halloween has passed and Thanksgiving is upon us. 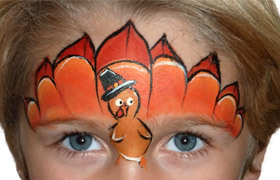 I haven’t really seen many Thanksgiving themed face painting designs, so I thought I would share one. This creative turkey how-to was painted by Lisa Joy Young, and she has a bunch more face painting tutorials up on her YouTube channel. Lisa is also a FABAtv instructor and has a couple online classes for you to expand your brush. If you haven’t experienced FABAtv, tune in on November 14th for a free LIVE body painting class with master artist, Mark Reid. 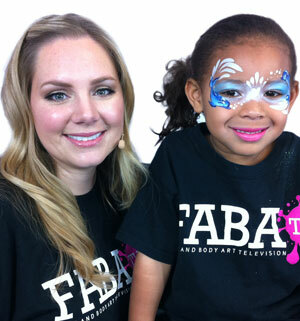 Grab your paint, pop some corn and pull up a chair to get ready for a free face painting class on FabaTV.com! You might of seen her on YouTube and watched her face painting designs, Lisa Joy Young will be on FabaTV LIVE this February! Tune in to FabaTV LIVE on February 15, 2012 starting at 8:00PM EST for this free class! Lisa will be teaching her Beautiful Birds class, where you will learn how to create bold and beautiful bird designs that boys and girls will love. She will show you different techniques on how to bring feathers and wings to life in a simple way. FabaTV is your online classroom for everything face and body art. With a FabaTV Subscription you can watch an unlimited amount of classes and paint with international artists right from the comfort of your own home. With new classes released every month there is always something new to learn on FabaTV! Classes can be paused and re-winded so you never miss a beat! Subscribe to FabaTV today and start your 24/7 learning!